- Updated: Premium plugins updated to the latest version. IMPORTANT: You need update Visual Composer (js_composer.zip) from package and a Theme! - Updated: jQuery ui for options panel. - Fixed: bug for thumbnails in Video slider shortcode. - Updated: Premium plugins updated to latest version. - Added: Fixed bug with saving category settings. - Updated: Premium plugins to latest version (in package). Now you can build two different layouts, YourMag - default and YourMag - Kesha! - Added: New layout Kesha! - Added: New Layout tab with many options for configure different layouts! Now you can use instead default Read more button link - link on any other site! 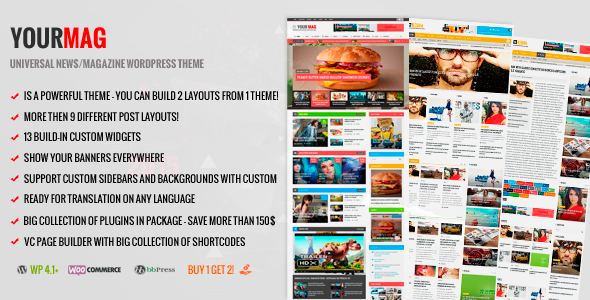 Required* You need update theme and Visual Composer plugin! - Fixed: Important Problem with theme speed, now it's loads faster up to 5 times!